Mothers Day. Don’t forget I sleep here, right above the shelter. 5 a.m., woke to pain cries. Downstairs I find Titus, whose 7th birthday would be coming up shortly, he’s near the foot of the stairs in the mud-room. I’m groggy and barefoot and the stone floor is cold. It takes me a few seconds to realize he’s in big trouble. He’s laying curled up in Gebo’s usual favorite spot, a little “hutch” next to the abandoned exerciser, the stepper my brother bought for me some years ago that now serves as a stanchion, a divider of space. He looks normal at first, then I notice he’s curled up oddly, rub my eyes, “what’s going on with him?” I wonder, clearly something’s wrong. It doesn’t look right the way he’s laying there, he’s intermittently crying and whimpering — then I see. He hoists himself up on his front legs and pulls out of the little conclave, dragging flacid back legs behind him. He literally screams at intermittent stages of movement. Clearly he is paralyzed, suddenly, inexplicably, overnight, and he’s obviously in pain. I feel shock, panic, it’s a Sunday morning, there’s only one veterinary hospital open on Sundays and it’s a long ride away, and what on earth happened? He was absolutely solid last night at the midnight check. I can’t believe what I’m seeing. For the first time in a long time I feel like I just don’t know what to do. I feel clueless, and then I stop paying attention to that feeling and try to think. I think of calling the rescue org, but it’s Mothers Day, it’s dawn, I can’t find the cell-phone number of the rescue professional there who had worked closely with me a year or so ago. I go online to try to look it up, I get to the website and the person I’m seeking isn’t listed there. There’s no emergency personnel or phone listed, only the main office, which is closed this early on a Sunday. But there are a lot of new articles and a celebrity endorsement video and a long list of hefty grants that have been awarded, and the usual rummage of spin. I feel sick at heart and realize I’m going to have to take charge, but I’m not awake yet, really. I think “I should get some coffee” — I was up ’til 3 last night and I’m exhausted. But I can’t be exhausted right now, or stop long enough to brew a pot. Throw water on my face, pull on my jeans, grab a shirt, no socks, and my rainboots. Titus is crying piteously. I look up the number of the emergency hospital, call there, explain, and am calmly told to bring him in immediately. Before hanging up, I mention I’ll need to apply for the Sampson Fund. I’m told the protocol is to apply for “CareCredit” first. I’m not sure what it is, so I have to google it, then I find it, apply, am turned down. Call the hospital again, am told to come in anyway, but to be prepared to pay 20% even with Sampson, which they aren’t sure I’ll qualify for, and then I’ll have to pay in full if I don’t qualify. I tell her I am absolutely broke, and I am. And it’s Sunday, and I expect a check this week but I don’t have a clue when it will arrive. I stop at the ATM and take out a twenty, leaving 56 in the account. I shuffle the credit cards in my mind, trying to remember which one still has some lee-way. Meanwhile, Titus can’t wait. I feel awful, I feel wretched, I feel, forgive the harshness of the words, like a failure. I don’t have any celebrity endorsements or PR about my victories with gov’t institutions, or rally cries to defend this or that preferred system. I’m just here trying to do the work out of my own pocket and I can’t pay a lawyer just now to wade through the edicts in order to gain tax-free status. Oh, I’d started on that route several years ago, but the actual work had to take precedence over the endless stream of convoluted red tape. Excuse me for the overt cynicism. It’s been a long day. Luckily, Titus had moved himself into a box against the wall while I was phoning, googling, applying and dressing. I shove the door of the extra large carrier up against the box and, thank God for small miracles, Titus just ups and drags himself into the carrier. I grab my bag, a folder with the taxes and the CareCredit rejection papers, my raincoat because it’s pouring outside, and Titus, and pile us all into the car and take off for the highway. On the way I feel weak, a shadow of myself. I just want to get there, but I don’t want to face what’s coming, because I sense it may not be good. I take a breath and say a quick prayer of thanks for at least having the car and the gas to get there. I tell myself the Universe won’t let me down. I struggle to believe it, but get into a battle of doubt and finally exit the whole thought pattern. I keep driving. Titus keeps crying. We arrive. A car pulls in just a minute ahead of me, and a couple with their tiny carrier in tow pop through the door before me. They aren’t urgent, and they are chatting leisurely. I sit down, putting Titus on the bench beside me. I decide to remain calm, after all, we are here now, and that is good. I manage to smile at the cute little shih tzu puppy the couple has let romp out of the cage. She starts barking, furiously. Titus is sitting quietly, watching the scene. Finally they sit down, and someone walks by and peeks into Titus’s carrier, he is lying there, probably looking like a normal cat resting, and she says “HI, kitty cat!” and smiles at me. I manage to groan a return smile. I feel awful. Finally the young woman at the desk calls me over. “I’m the one who called earlier about the cat with sudden paralysis” I say, “was it you I spoke to?” She looks blank for a minute and doesn’t answer. “Are you Sarah?” I ask. “Oh” she says, “It was Sarah”. Ok I don’t care who it was so I tell her again what I’ve seen and why we’re here. A few minutes of her asking and typing and me answering questions. I have to give my social, because I’ve asked for Sampson Fund, I’m very uncomfortable, this whole thing is scary. I sit back down with Titus and wait, I don’t know how long it was. I’m trying to corral my thoughts, talk to Titus, reign in my nerves. Then a tall lady with dark curly hair calls Titus’s name, I bounce into action. She tells me she’s the assistant and will be taking vitals, etc. as she leads us into the exam room. Once on the table, Titus is snarling when she tries to touch him, so she gives up on that for the moment, tells me she’s going to talk to the doctor and comes right back after a minute. “We have another emergency right before you,” she says, “so it may be a few minutes, but you can just stay here and wait, OK?” “OK,” I say, weakly. It seems like forever. But finally a petite and wiry smooth-haired blonde lady comes in and introduces herself as the doctor. I’m immediately relaxed in her presence, she is like a glass of water in a drought. She apologizes for making us wait, but I’m just glad she’s here now. She looks me directly in the eye and thus ranks up to a high level on my sincerity chart. I tell her everything I know, and what I don’t know. I mention cryptococcus, because I’d read that was one of the things that could cause sudden paralysis, but can be treated. I’m hoping she can fix him. She has to take Titus away to a larger room because she’s needing some helpers to handle him, and asks me to wait there, politely, as if giving me the choice to refuse to wait and insist upon going with her. I readily comply, I just want him helped asap. I also don’t want to be in the way. Another long while passes, she pops her head in and tells me they aren’t quite done, but that Titus is behaving very well and is compliant. “Good” I think, “at least he’s not fighting.” Another long wait. Then the door opens. I knew from her first sentence, I wanted to interrupt and say “I know, I know” but she had a whole lot of diagnostic possibilities to report. I sat listening, nodding my head. I felt like one of those rear window bobble-head puppets. Now I’m dropping pearls of sweat down my back. “It’s OK, I understand. Will Sampson at least cover the exam?” I ask. “I came with a 20 in my pocket and a couple of extra dollars, thinking I was going to have to pay 20% of the exam fee, and I have a little credit on a card I could use for 20% of any other charges beyond that, but I was going for Sampson. And if I can’t get Sampson, I can’t pay in full today.” She says “I will have to check on that, I’ll be right back.” What kind of health care, either veterinary or human, ISN’T about money? I’ve seen the top floor velvet suites as Mass General. I’ve had state low-income health coverage. I know all about it. I’ve, sadly, become used to it. I’m worrying that I won’t be able to even put him to sleep and dreading a prolonged suffering for Titus if I can’t. I tell myself there’s got to be a way, even though I was already informed that this hospital does not extend credit. The door closes behind her and I am praying that they get the line in now. Just praying to be able to say good-bye, but not very hopeful. I feel blessed when she returns and tells me I can come in. Titus is on a table in the large surgical area. They didn’t want to move him into the softly-lit special room usually used for euthanasia. He’d already been given a sedative. I leaned in and kissed him and stroked his head and told him he was a good boy and “I love you” and couldn’t stop the welled-up tears from rolling over my eyelids, when the doctor said “That’s good, just keep talking to him that way.” I said “bye-bye sweetheart”, trying to keep from sobbing, and then it was over. Just like that. I won’t belabor the scene at the front desk, where I was allowed to put down 30 dollars in scrambled bills and change, and where I was informed I could work out a payment plan for the rest I owed, which was significant, but that I would have to call the next day and speak to someone about setting it up. It’s just how it is right now, I will pay them eventually, and I am grateful that they did whatever they could do. But I would like to add that I have become aware, that if you are poor, people tend to dismiss you or assume you have no brains. Not that these people did that in any offensive way, just a note. I have the same brains now that I had when I was getting tons of money every week in a “great” job I began to abhor just a few years into a rather miserable career experience during which I fell ill several times over a span of 23 years. Make no mistake about that. They brought Titus out wrapped in a little white coffin-shaped box, which made everyone in the waiting room gasp. A kind man with tenderness on his face, opened the door for me as I left. The assistant carried out the crate I’d brought Titus in with, and she looked me in the eye and said “I’m so sorry” and I believe she meant it, I thanked her and asked her to thank everyone for me and I got back in the car, with Titus on the passenger seat, and drove back. Upon our arrival, I brought Titus in, and placed his little box on the spot where he’d last been, because ALL of the cats had witnessed his distress, and had taken note of what was going on. 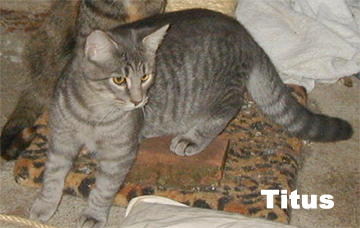 I have to add that Titus was beloved by EVERY ONE of the cats. He just was friends with EVERYBODY, though he had a special closeness with Wendi and Rowena, both of whom slinked up and sniffed their good-byes. The cats have been extraordinarily quiet all day and I also noted that the food bowls had been only sparingly touched. Just FYI. An hour or so later, a good friend came and we dug the grave and buried Titus near the flower garden. Then we went upstairs and shared a cup of tea. Then I spent an hour-and-a-half scooping, watering, feeding, cleaning. Then I went to see my mother, still in my ratty clothes. Happy Mothers Day, amen.